For clients requiring a minimum run of 500 discs, we recommend replication. Discs are 'pressed' using a stamper, produced from a glass master - the discs are physically manufactured from scratch using an injection moulding machine. This method will produce an output the same as a retail disc. 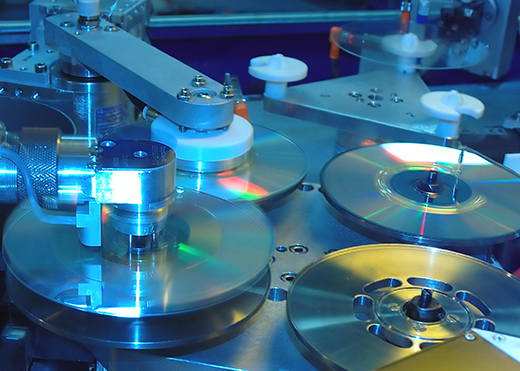 As well as producing CDs, various types of DVD - DVD5 (single layer), DVD9 (dual layer) and DVD10 (1 layer on each side of the disc) can be produced. Our factory works to the highest possible standards with rigorous quality control. We prefer replication masters to be delivered electronically in DDP (2.0) format. This allows an automated process of supplying the master to our manufacturing plant. For DVDs, authoring programmes such as DVD Studio Pro or Adobe Encore allow you to export your authored DVD in the correct format. For CD products, ask your studio to supply the files during the mastering process. We can accept physical masters on CD-R or DVD-R media, but please ensure the discs are not scratched, do not touch the writeable surface or use +/-R media. If you'd prefer us to handle the authoring process, simply supply your video file and we'll do the rest.